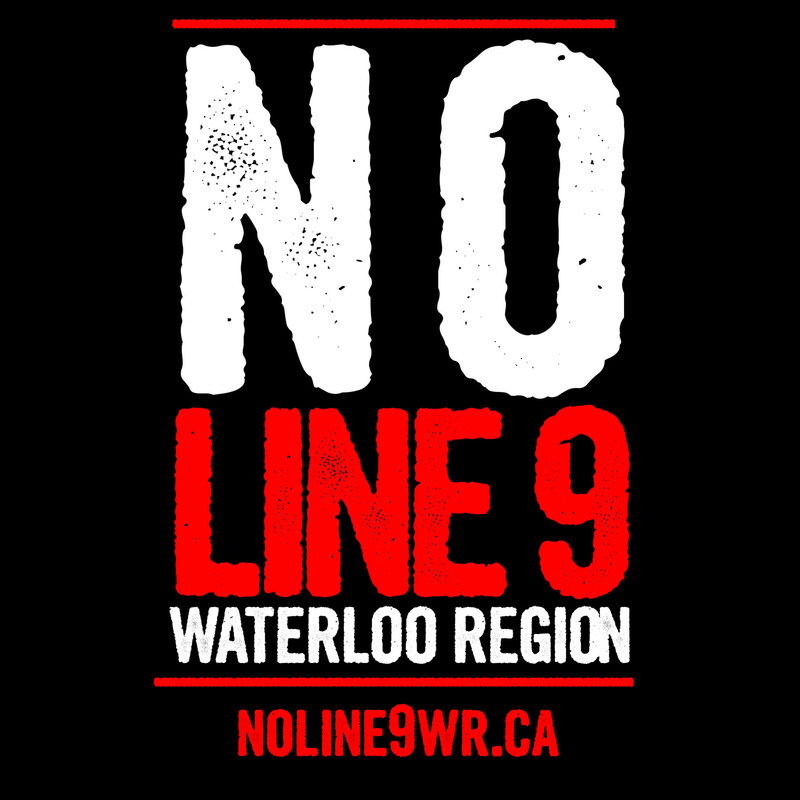 One year after their initial visit to council chambers, the Waterloo Region Coalition Against Line 9 followed up on September 17 with a presentation urging Waterloo region to enact a ban of the transport of tar sands dilbit through the municipality, and to ensure that the region does all it can to honour settler treaty responsibilities to Indigenous nations for all resource and development projects. Good evening Councilfolk, I would like to begin today by acknowledging that we are on the Haldimand Tract, which is the Grand River Territory of the Haudenosaunee of the Six Nations. We say this to bring attention to our responsibilities as settlers on this land, responsibilities to the Onkwehonwe people and to the treaties and agreements our governments have made with them. We also seek to acknowledge the ongoing legacy of colonialism Canadian settlers have on Turtle Island, and specifically here on blocks 2 and 11 of the Haldimand tract where monies held in trust for the Haudenosaunee for land purchases were pilfered for several private corporation and government projects. My name is Dan Kellar, i am a lifelong resident of the Haldimand tract and I am a member of the Waterloo Region Coalition Against Line 9, a grassroots network of community groups, passionate individuals, local businesses and farmer unions. It has been one year since the Coalition was last in front of council and it has been a busy year. After our visit, we were pleased that the regional council adopted a statement of concern around Line 9, asking the National Energy Board to require that Enbridge undertake an environmental assessment of the pipeline and having a one billion dollar emergency fund with equal insurance coverage for the project. We were heartened that, as council’s engagement last year shows, you share concern for the Grand River Watershed and the implications for our region from questionable resource projects. Our particular concern regarding the Line 9 reversal has only grown over this past year as more evidence has come to light about the severity of its impacts and Enbridge and the federal government’s ongoing disrespect for their treaty obligations. Enbridge has been driving around southern Ontario with a briefcase full of cash trying to buy “consent.” While time is running out, there is still an opportunity to intervene in this dangerous project and protect the watershed. In this year, the NEB hearings saw over 100 intervenors in Toronto and Montreal. With less than a handful supporting the project, the vast majority -- from Chippewas of the Thames and Kahnawake to the Ontario Ministry of Energy -- voicing strong concern. In this past year, thousands have flooded the streets in many marches and actions against climate change and people have taken action to shut down the construction work on Line 9 for over 20 days, in defense of their communities and the ecosystems around the line, including here along the Grand River. This year it was also revealed that Enbridge has been pouring tens of thousands of dollars into the budgets of police forces along the Line 9 route. In this year, CTV released an investigative report that showed Line 9 had 35 major incidents in the past 38 years, while Enbridge had long claimed only a dozen spills, and that figure still only represents those spills large enough to make it into official records. We have also seen Enbridge trying to skirt around project requirements, with the NEB actually suspending their operations in the case of the Saskatchewan to Manitoba Line 3 pipeline. Over the past year, the health impacts of the tar sands -- the cancers and other diseases their extraction causes -- have been further documented by major university studies. Its has been a year and Line 9 is no more suitable now to ship toxic tarsands dilbit or volatile fracked oil from the "Bakken" shale fields in North Dakota than it was last year, nor have these extractive projects become less devastating to the land they plunder. Despite these troubling developments, the NEB is beginning to issue permits for the line to operate. This process is far from complete, however, and this is a crucial moment in which to act to interrupt the rubber-stamping of a project that puts us all at risk. There are active legal challenges to the NEB’s initial decision that have not yet been resolved. The challenge from Chippewas of the Thames raises a fundamental issue with the approval process, as they, like the other Indigenous communities along Line 9’s path, were not consulted, nor have they given consent to the project. In July, work on the Line 9 project adjacent to the Grand River in North Dumfries was stopped by members of the Haudenosaunee Mens Fire and Indigenous and settler allies, after Enbridge failed to properly consult with Six Nations whose territory Line 9 crosses. By allowing Enbridge to simply walk away from their conditions when they are faced with the need to consult, the NEB is furthering a racist colonial legacy with this environmentally damaging industrial project. In the NEB’s approval of the project, the conditions they mandated -- which ignored the requests issued by this Council and other intervenors -- included the completion of “integrity digs” and repair work. Now, Enbridge is being excused from even completing this most basic work, which speaks to the fact that neither they or the NEB are in fact concerned about safety or environmental protection. When we last spoke to Council, there was hesitation regarding the role that Council could play, and a sense that there was no opportunity to intervene. While in many ways that is true, and decisions that directly impact us here are being made by the NEB and other such bodies, cities and municipalities elsewhere in Ontario and Quebec are demonstrating ways in which steps can be taken at the local level. Just last month, the City of Toronto moved to request that Enbridge not ship diluted bitumen through the city. In some cases, cities have implemented bans on such dangerous substances within their jurisdiction. The Mayor of Montreal spoke out last week about the Line 9 process, decrying the lax structures which are allowing permits to be issued without even minimal safety measures having been fulfilled. Eight municipalities have called for an Environmental Assessment to be conducted by the province, a basic step towards making decisions about projects such as this. Today our request to the Waterloo Regional council is clear. We urge the Waterloo Regional Council to protect the Grand River watershed by passing a resolution to ban the transport of the dangerous toxic slurry of diluted bitumen (dilbit) from the tar sands. We further ask that the regional government uphold its responsibility on the Haldimand tract by standing in the way of the colonisation wrought through the Line 9 project, by insisting that Enbridge and the NEB fulfill their obligation to consult with Indigenous nations, and to wait for the legal appeals to be heard, before taking any further steps.